Unfortunately, BO and his "around behind Congress's back" actions to add hundreds of more business-expansion killing regulations completely wiped out any incentive the extension of the Tax Cuts made. BO just can't get it right...everything his does kills, stops or causes great slow-down of the free enterprise system. I have to wonder what in the he** he learned in his upbringing and/or schooling. It certainly was not positive! Then that is your premise. Speak for self. It's just that many people are uneducated, don't really know much and are guided by emotion and dogma. They want to blame Obama for their problems as if they didn't, they'd have to face that it Republicans who had the vast majority of the political power in this country leading up to the economic collapse. Instead of actually thinking though, they'll just blame Obama because they act like emotional children. Actually, your above statement "They want to blame Obama for their problems as if they didn't, they'd have to face that it Republicans who had the vast majority of the political power in this country leading up to the economic collapse." is very incorrect. The Republican Senate, during President Bush's terms up through 2007, NEVER had enough Republican majority to stop the Dems from filibusterin and blocking good legislation that was needed. The Dems either blocked or threatened filibuster if any bill were brought to the floor to correct the economic disaster that President Bush and the Republicans saw coming. Then, of course the Dems took absolute control of both House and Senate in 2008 and started spending us into oblivion plus passing legislation with crap pork attached...there were not enough Republicans in either house to stop them, plus they attached the "crap" to required bills like paying and taking care of our troops, etc. So President Bush signed them...can you imagine what hullabaloo would have been brought against him if he had vetoed bills paying for necessities because of the "crap pork" and crap spending the Dems added to them? The ONLY blame for the 2008 breaking downturn goes to the Democrats in the Senate and since BO's election all 3 bodies have buried us in very deep a pit of horror since he took office. I'm confused. Is it because of Obama's policies finally taking hold or the consequences of the 2010 election. Liberals blamed the poor economy on the "teabagger" congress. Can a liberal, or better yet, an Obamatron (since they're much more pragmatic and loyal to Obama than a liberal) spin this one for me to make sure it maximizes credit for Obama? 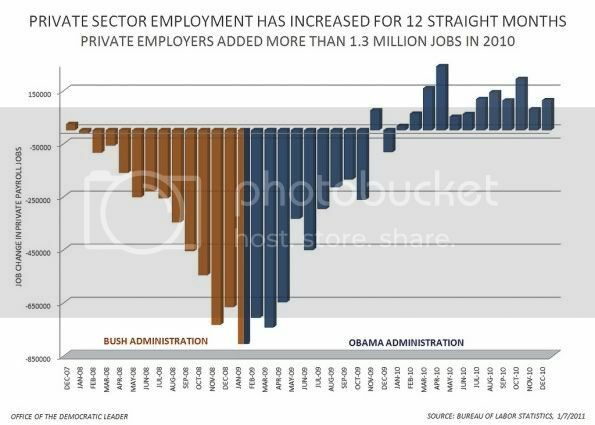 Those jobs were not due to the Dems or Teabaggers, it is a private sector thing, THAT is where the vast majority of jobs come from. Those jobs were not due to the Dems or Teabaggers. Take that up with florida.bob. I have a theory, I don't think businesses hire because of any political party. Comprehension is hard for some. I still have no idea why our nation blamed the Democratic congress and the Obama administration for the economic woes (well I do - there are lot of ignorant, uneducated idiots out there). They effected quite an amazing turn around from the worst financial crisis in 70 years and prevented the Bush Recession from becoming the Bush Depression. Yeah I wish it were faster, but it was the worst financial crisis our our lifetime and as Obama said when he was campaigning, the recovery will be measured in years, not months.